"The sea's rules can be ignored only at real, physical peril, not at mere risk of social or financial penalty." Sometimes being an aspiring blogger comes with the unfortunate consequence of reporting and editorializing heart wrenching stories. That's the case today as I write about the tragedy in the latest North American Rally to the Caribbean (NARC). Many bloggers and media outlets already reported on the sad story of the cruising vessel Triple Stars back in November of 2011. I refrained from blogging about the event at the time because I felt the story was well covered, and frankly, too sad to write about at the time. Now that time has passed and new details related to the story have surfaced, I feel compelled to share the tragedy of Triple Stars here on my blog today. For those unfamiliar with the NARC, it's one of several cruising sailboat rallies that groups several boats together for a passage from the mainland United States to the Caribbean. The advantages of such a rally are many including camaraderie, safety in numbers, an organized passage, free weather routing, and many social events. The 2011 NARC departed Newport, Rhode Island for the island of St. Martin on November 1st with a fleet of 22 sailboats ranging from a 36-foot Columbia to an Oyster 56. The event is not a race, but rather a passage made together by a fleet in communication with each other throughout. Rob Anderson and his wife Jan had been cruising together since 2007. 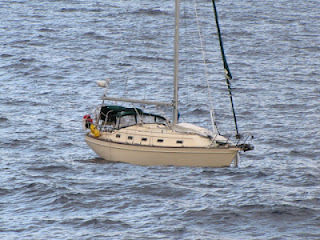 They were experienced cruisers looking forward to a winter spent in the Caribbean aboard their Island Packet 38 cutter. The 2011 NARC was their ticket to the islands. Shortly after receiving an EPRIB notification on November 11, 2011, the U.S. Coast Guard received a radio distress report from Rob aboard the sailing vessel Triple Stars stating that his wife had been washed overboard by a 30-foot wave. The USCG then reported they were searching the Atlantic Ocean 285 miles northwest of Bermuda for an overboard sailor. At approximately 5 p.m. on November 11, the merchant vessel High Jumper evacuated Rob from Triple Stars and continued the search for Jan. Neither High Jumper, the USCG, nor the rally fleet were able to locate Jan. She was lost at sea. Autopilot malfunctions and a problem with the mainsail onboard Triple Stars may have contributed to the tragedy. But more assuredly, the stormy conditions near Bermuda (possibly combined with the aforementioned issues?) were to blame. Rob Anderson later told the USCG: "We were hit by a 30-foot wave. My wife went through the bimini top and I saw her floundering in the water. There were 25-foot seas and I threw her a life ring which she grabbed onto, but when I brought the boat around, I saw her go under and not resurface." Based on the research I've done, I don't believe Jan was tethered to Triple Stars, though I do think they had jacklines, harnesses and tethers available as required to participate in the NARC. So what are the new details about the story that have recently come to light? A Holland America cruise ship (Prisendam) spotted the abandoned Triple Stars adrift in the Atlantic on March 14, 2012. Reportedly, the captain had the cruise ship do a slow circle around the ill-fated Island Packet and sounded the ship's horn to no response. Radio communications with the Bermuda Coast Guard confirmed that Triple Stars was known to be abandoned and adrift. Remarkably, Triple Stars seems to have weathered the storms and time alone at sea very well. I don't know her ultimate fate, but I'm guessing Rob Anderson would have very mixed emotions about recovering and repossessing his vessel. Maybe he's already settled with his insurance company and Triple Stars has been written off. Both my mom and mother-in-law read this blog, so there's risk to my future cruising aspirations in me bringing such sailing tragedy to light. I'm not sure what to make of this whole story. It's sad and difficult to write about. But I think there are important lessons to be learned. Not so much lessons that lay blame on the Anderson's actions, but lessons that remind me how the cruising life is much more serious than just palm trees and martinis. You can read the Anderson's logs just days prior to the tragedy on their blog.